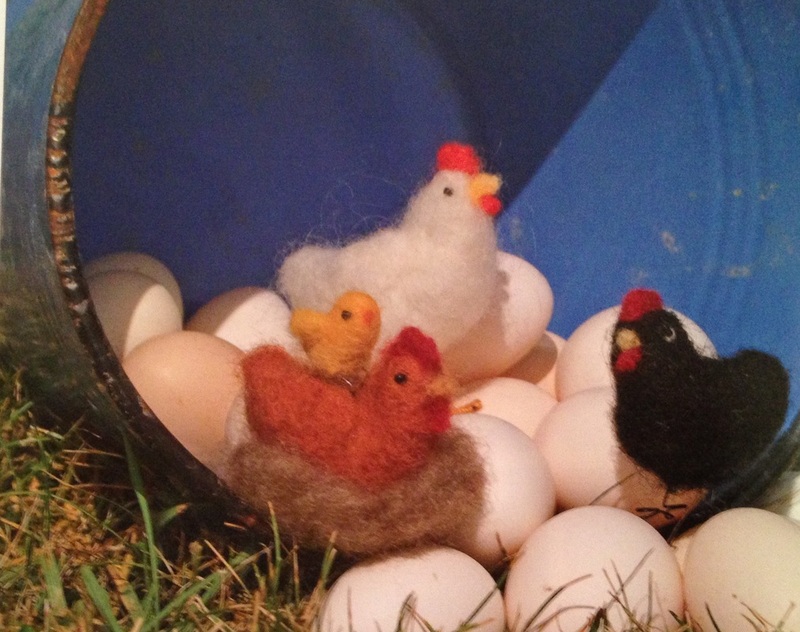 Obtain the basic materials for your second project: Several chickens, a nest and a chick. 1. Measure a 6" x 3" (15.2 x 7.6 cm) piece of red-brown wool. 2. Roll tightly into a triangle shape. The top part of the triangle measures 2 1/2" (6.4 cm) and will be the chicken's back and tail. The two shorter sides measure 1 1/2" (3.8 cm) and will be the chicken's breast and the underside of the tail. Needle the chicken's body to keep the shape from unrolling. 3. Roll a 1/2" (1.3 cm) ball of red-brown wool and needle to hold the shape. 4. Position the head on the body and needle to attach. 5. Needle the tail into a flat, fan shape. Turn the chicken over and needle the underside of the tail. 6 Needle a 1" (2.5 cm) long piece of red-brown wool into a flat, small wing shape. Make two. 7. Position the wings on either side of the body and needle around the edge of the wings into the body to attach. 8. Roll a small piece of red wool between your fingertips and place it on top of the chicken's head. Needle the comb to the chicken's head. 9. Make a cone-shaped beak by rolling a piece of yellow wool on the pointed end of a wooden skewer. Remove the yellow cone from the skewer and needle it onto the chicken's face below the comb. 10. Add apiece of red wool to each side of the beak for a wattle. 11. Sew black beads onto the side of the chicken's head for eyes. 12. Roll a 3" (7.6 cm) long piece of yellow wool into a triangle shape that measures 1" (2.5 cm) long. Needle the surface to keep the wool from unrolling. 13. Fold a piece of yellow wool into a wing shape. Make two and needle the surface of each wing to shape them. 14. Attach the wings to each side of the chick's body. 15. Roll a piece of black wool between your fingers and needle it onto the chick's face for a beak. 16. Sew black beads onto each side of the chick's head for eyes. 17. Shape a palm-sized amount of brown wool into a bowl shape. Needle the bottom of the nest, then turn it upside down and needle from the opposite side. 18. Lay the nest on its side and needle the sides all around. 19. Place the chicken and the chick inside the nest. If desired, attach the chicken to the nest by needling the fibers at the base of the chicken's body into the base of the nest. The same can be done to attach the chick to the chicken. Position the chick on the back of the chicken and needle the yellow fibers on the bottom of the chick into the chicken's back. 20. Repeat the appropriate steps to create another chicken using white wool. 21. 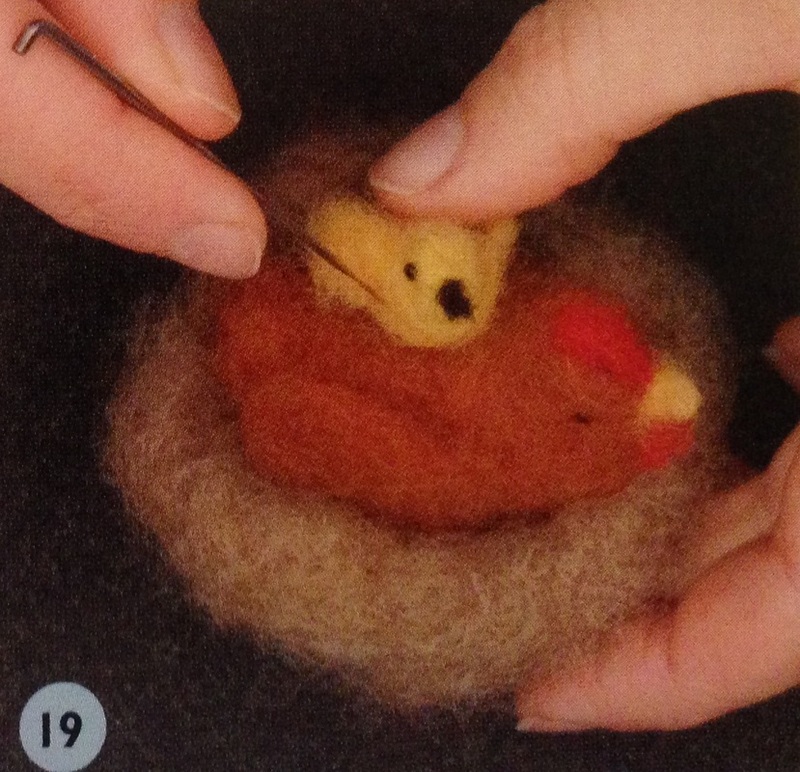 Repeat the appropriate steps to create a third chicken using black wool. 22. Arrange your creations for a nice group photo and/or set up a nature display table in your house or studio using props like a blue metal pail and several eggs.